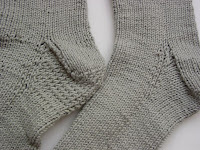 Froggy's Fiber Followings: Glad to be done! The tops were a little stretched out in this picture cause I let my husband try them on. They were original supposed to be for him after all. Fortunately, my husband doesn't wear socks and these were a little snug. 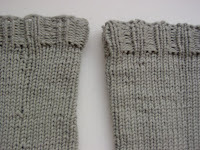 Next pair will need to be done with a stretchier yarn. Wow! am I impressed! Really! 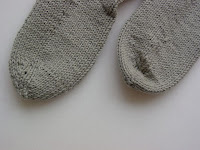 TWO completed socks. Congratulations!